Available in 24 shades, the Diorskin Forever Perfect Foundation is a matte, medium-to-full coverage foundation with an SPF 35 sun protection. The product is packaged in an elegant frosted glass bottle equipped with a convenient pump dispenser. The formulation is creamy but lightweight; it blends beautifully and provides a very good coverage. 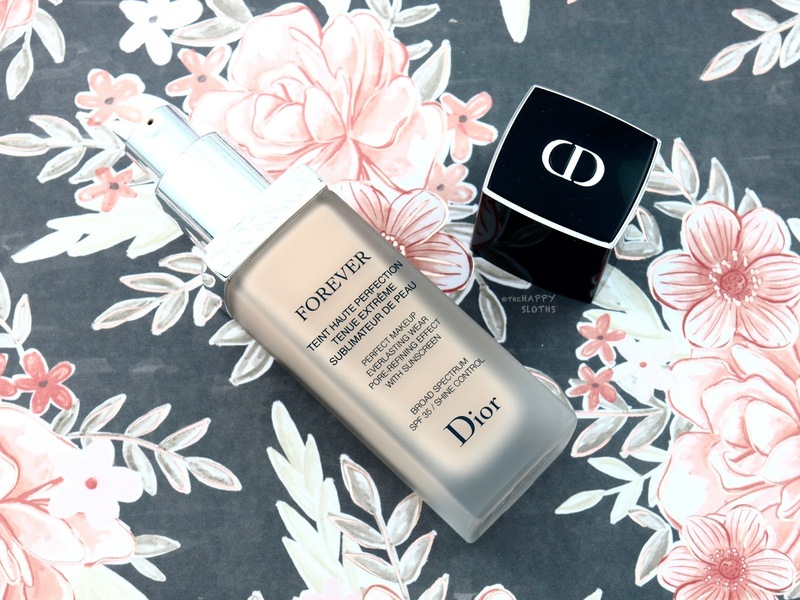 Discounting the difference between their packaging format, the Diorskin Forever Perfect Foundation and the Airflash Spray Foundation actually provide a very similar finish and feel- not super smoothing and cushioning but very natural and skin-like. 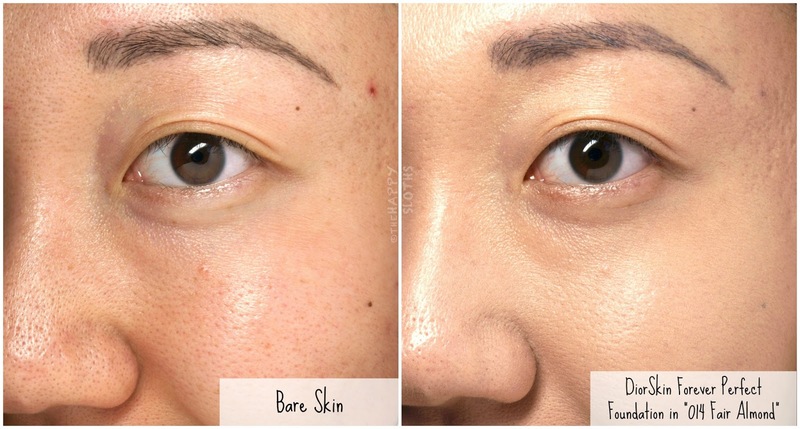 The Forever Perfect is slightly sheerer compared to the Airflash spray but there is no patchiness and the product doesn't emphasize pores or fine lines. Dior Diorskin Forever Perfect Foundation in "014 Fair Almond"
I have the shade "014 Fair Almond" here and although it swatches like a light, cool-tone ivory, it oxidizes noticeably to a warmer light beige that's a pretty good fit for my natural skin tone. The Forever Perfect foundation wears wonderfully as well. There's minimal creasing and fading at the end of the day and the formulation keeps oiliness at bay. Overall, I think this is a pretty good alternative to the amazing Dior Airflash Spray, albeit in a liquid form with the added bonus of an SPF 35. I'll definitely be reaching this one on a regular basis! 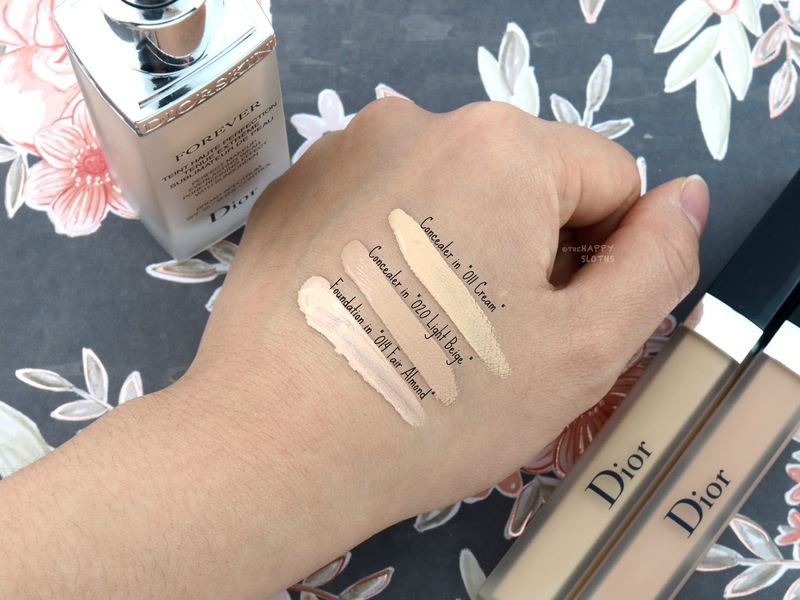 Dior Diorskin Forever Undercover Concealer in "011 Cream" & "020 Light Beige"
Forever Perfect Foundation in "014 Fair Almond"
Available in ten shades, the Forever Undercover Concealer is a full-coverage waterproof concealer packaged in a slim, frosted tube equipped with a doe-foot applicator. The formulation is on the thicker, drier side so it takes some effort to blend but once it's blended, the finish is smooth and matte. The coverage is as good as it gets and the finish is brightening. 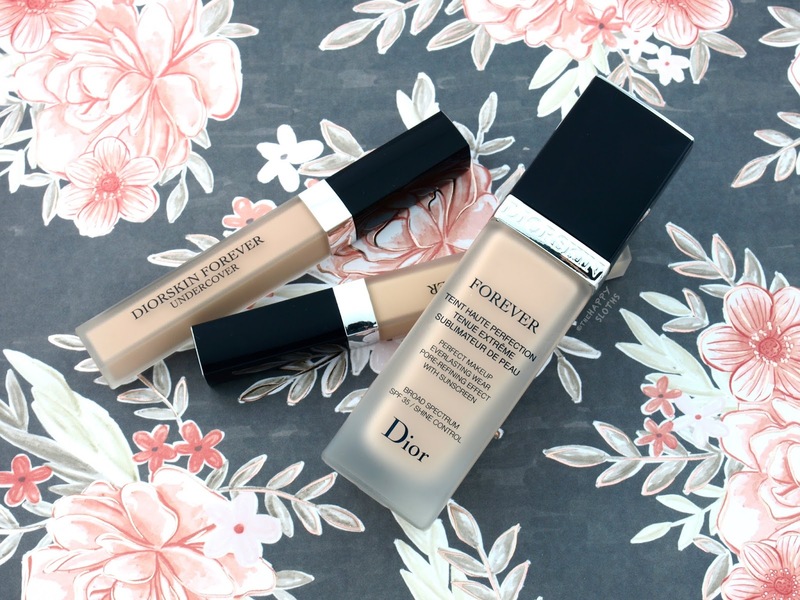 So whether you are covering blemishes or undereye circles, the Forever Undercover Concealer gets the job done. I have swatched two shades above. "011 Cream" is a pale ivory with neutral undertones while "020 Light Beige" is a neutral beige. Neither is a perfect match for my NC20 skin tone but I can definitely make do with "011 Cream". As you can see below, the coverage is phenomenal! The formulation camouflages every flaw but there is definitely some creasing and fading throughout the day. 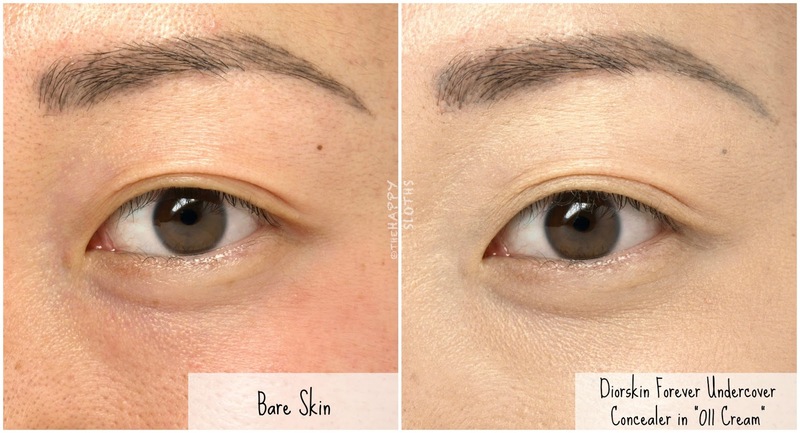 Also, if you have dry or mature skin, the thicker formulation may emphasize wrinkles or dry patches but overall, this is a great full-coverage concealer suitable for most skin types. 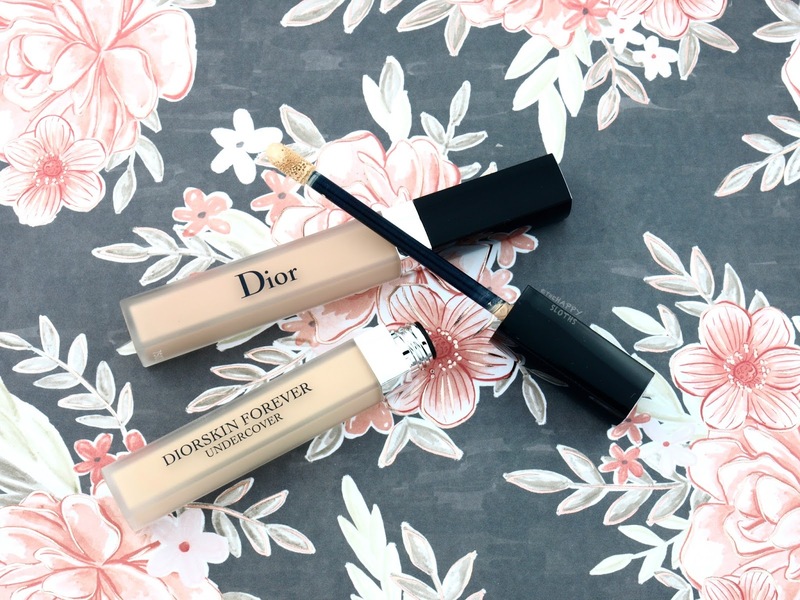 Dior Diorskin Forever Undercover Concealer in "011 Cream"